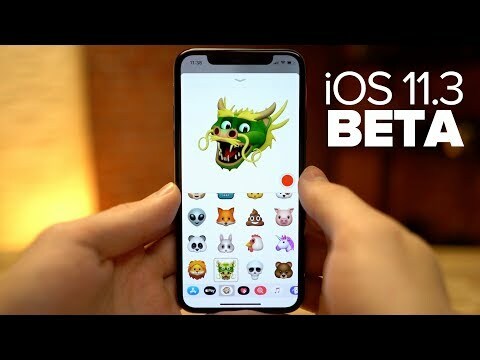 In an unusual move, Apple previewed iOS 11.3 at the same time as providing it to developers in beta back in January, with a view to a spring release.Six beta editions have been released in the months since. Apple has already released iOS 11.3, but only for the recently-launched sixth-generation iPad, with other iPhones and iPads believed to get the update in the following days. Now, the new operating system is available to the public for older devices. The release itself is largely in line with what was detailed by Apple in January. The iOS 11.3 shows new transparency about battery health on the iPhone, including recommending whether an iPhone's battery needs servicing, as well as whether the power management feature is on. We got our first look at those settings back in February, which included such features as Maximum Capacity percentage and Peak Performance Capability. The battery health feature, released in beta, is introduced in response to the ongoing battery throttling controversy, in which iOS would purposefully reduce the processing performance of an iPhone if the battery has degraded too far. For iPad users, the included "charge management" is intended to maintain battery health when an iPad is connected to power for prolonged periods of time, such as in kiosks, point of sale systems, and stored in charging carts. The iOS 11.3 release includes the new Health Records feature, which builds on the existing Health app to include encrypted and password-protected medical data, from across multiple providers. In late January, 12 major healthcare providers announced their support for the Health Records feature. It will also allow health providers to share records with each other. The new release features ARKit 1.5, which builds on the original ARKit in order to make certain actions possible, such as integrating real world images into AR experiences and placing virtual objects on vertical surfaces. For example, movie posters and signs can be made to trigger AR animations viewable through an iPhone or iPad. "The pass-through camera view of the real world," Apple says, "is higher resolution and supports auto-focus for a sharper view in more situations." It is said that the resolution supported by ARKit 1.5 will be 50 percent greater than in the original release. Apple Music now includes music videos as they are released by Apple, including ad-free streaming and the ability to create playlists. Both old and new videos are featured, with Apple-curated playlists available by genre. Originally intended as part of iOS 11.3, it was released early as an app update on Thursday. Apple also added the option of finding friends with similar tastes in music, with updated suggestions that reveal genres people enjoy and identifying mutual friends who like that style of song. The new iOS Advanced Mobile Location now automatically sends a user's mobile location during calls to emergency services. This change is expected to encourage more municipal governments to sign their first responders up for the service. First discussed at the 2017 WWDC, Apple has enabled HomeKit Authentication. After the update, HomeKit peripherals connecting to an iOS 11.3 or tvOS 11.3 device can use software for encryption rather than a dedicated chip on board a peripheral. This should enable HomeKit on some older accessories through a simple firmware update, though in practice the processor demands of Apple's encryption may limit upgrades. As discussed by Eddy Cue in his South by Southwest interview, Apple News will be improved, with a better Top Stories section and a video feature called "For You." It is now possible to sort customer reviews on product pages by the most helpful, most favorable, most critical, or most recent. The information about changes to apps in the Update tab has been improved with regards to the app version and file size shown to users. The new release features a quartet of new Animoji- a dragon, a bear, a lion, and a skull - which can be used to message others as well as for the production of Animoji karaoke videos. One feature expected to arrive in iOS 11.3 but hasn't is AirPlay 2, an upgraded version of the existing AirPlay communications protocol for streaming audio. The main improvement is support for streaming audio to multiple devices simultaneously, such as HomePods and Apple TVs, as well as incorporating AirPlay 2-supporting speakers into HomeKit. The standard was in the first two 11.3 betas, but subsequently disappeared for reasons unknown. Phone is downloading now. Hmm... I wonder how healthy the battery will turn out to be. Looks like beta 6 was the final build, no update available here. Hm. I still had a few niggling bugs. Apparently Messages in iCloud is missing in this GM. I’m on beta 6 or whatever and I have it though. My SE is 87%. Not bad. Do we know if Messages in iCloud is in fact missing in action, or if AppleInsider just forgot to mention it? Yes, iPod Touch 6th generation can be upgraded to iOS 11.3. CRAP!! I mean CRAP!! iOS 11.3 requires iTunes version 12.7.3 to be installed. I use version 12.6.3 to manage my apps on my iPads and iPod Touch. It's not present. It was removed during the beta process. So, according to the new Battery Health (Beta) feature, it says that my iPhone 6 Plus (bought in late October of '14) is 99% of what it was when I purchased it. Which is just bunk. I'm on the list to get a new replacement battery because it can't make it through the day without a recharge. I was kidding a few weeks ago, but it looks like airplay 2 will roll out around time for WWDC. Seriously? It was one of the features I was eagerly awaiting! How much time do they need to figure it out? At this rate, iOS 12 will be announced before Messages in the cloud is rolled out - if it is ever rolled out. Have you tried anything at all to help battery life? Turn the screen down a bit, kill the background app refresh etc? Have you restored your phone recently? Is there an app eating your battery that you aren't aware of? Have you done anything at all to try and see what the cause of your drain? Even a good battery can be drained prematurely if there is something causing the drain..
What's "bunk" are people who jump on the internet and trash an update, or a new function yet have no idea how to maintain their device? Not mentioned in the article, but I think battery health monitoring is iPhone 6 and up. Not seeing it on my 5s, although the Lirium app tells me it’s in pretty bad shape. Runs great on my 5s. Let’s trade. Any early adopter problems like frozen apps, random shutdowns, fires? Nothing immediately apparent, but most of the United States is at work. We'll see over the next few days. Seems after removing Airplay 2 and iCloud iMessage sync there's not really anything of any significance in iOS 11.3. New animojis and a UIView for data the OS already knew..! Yay... these things should be in a minor point update, not major. What is going on at Apple? I can imagine iCloud message sync is pretty complex, but Airplay 2? With the number of engineers Apple has, and the seeming near-complete state of Airplay 2, what on Earth are they actually doing? Development seems soooo slow nowadays. Seems after removing Airplay 2 and iCloud iMessage sync there's not really anything of any significance in iOS 11.3. New animojis and a UIView for data the OS already knew..! Yay... these things should be in a minor point update, not major. Not defending Apple but this isn’t a major update. It’s a point update. Let’s hope they are holding back on Messages in iCloud and Airplay 2 because they are not happy with how they work and intend on reengineering both to make them rock solid. As for me I’m I beta 6 I think and I have messages in iCloud. But all of my Macs are running Sierra so it’s of no use to me ha.